I got some good constructive criticism recently about the ways that I express myself regarding feminism, and it's got me to thinking. A friend of mine who is active in various feminist realms, pointed out to me that my writing about feminism often feels "detached", and as such is frustrating to her, because she sees that from other men who identify as feminists (or pro-feminists) as well. From her point of view, when it comes to men and feminism, the ways that men express themselves often betray that it's 'Just Theory' to them. I started off writing this post imagining that I would write something definitive, but then i recognized what a big issue it was--for me and perhaps for others--that I thought I'd just throw some ideas out there and see what sticks to the interweb, and hopefully write some follow-up posts. On the face of it, it's pretty obvious why feminist men have to be careful to not slip into Armchair Feminism. Women feminists have constant, personal reminders (all too constant) of why the world needs feminism -- they experience (for instance) sexism daily on the street, at work, and at home, and they experience it as a loss of freedom, of safety, of fairness. But of course men also live in this world, and once men start viewing the world through feminist lenses, we also have daily reminders -- living in a sexist world, how could we not? And I would even say that we experience a loss due to sexism: Men lose out on being fully human, for instance, due to the gender socialization that teaches them (oversimplifying here) to "be strong" and "be a man". I think it's important to not play that experience of loss down, because I think it is lived experience, and because it affects men on deep levels that aren't acknowledged enough (especially by men themselves!). That's one reason why I find myself talking about it quite a bit here at FA. That said, from where I'm standing, talking to friends and interacting with other feminists in various ways, there is a way in which feminist women have less choice about being active in feminism, in fighting the good fight. Women feminists (at times) have to fight the good fight because the fight is so often brought right up to them. 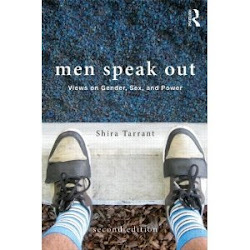 Feminist men more often have the luxury of being able to speak from a theoretical perspective, and we are to various degrees blind to the ways in which male privilege encourages us to speak only from a theoretical perspective. Some of the, shall we say, "tentativeness" with which I write about feminism comes from the complexities of being a feminist man, of wanting to carefully navigate space that has been created by (mostly) women, and in some cases is thought of as a safe space for women, a refuge from a sexist world. Which is not to say that I haven't felt entirely welcome in some feminist spaces--in fact, I've felt very welcome in most feminist spaces, both online and in the Real World. But feeling comfortable doesn't stop me from being careful, looking for blind spots related to male privilege, and making an effort to listen when my socialization encourages me to talk. My constructively critical friend might say that I'm too careful, and that may very well be so. Or perhaps I just haven't learned (yet) how to navigate without being overly careful. Or, perhaps, I'm comfy in my Feminist Armchair, and I'm using this stuff as an excuse. Likely it's a mix of all of this stuff. I'm much more interested in discussions these days than I am in debates. The two often overlap in various ways, and it does come down to a matter of style, which will resist strict definitions. But for the most part, if somebody comes to the table with a point and some questions about it, I'm much more likely to want to interact with them than with somebody who comes to the table wanting to prove to me me that they have a point. There are places where I'm not as flexible regarding my convictions, where things play out more definitively. I vote for candidates, as often as I can, who vote along the lines of my feminist ideals. I call out sexism at work, and out on the street. I wear the label of feminist (although I don't make an issue of it if I'm in a space where such a label on a man isn't very welcome). I call out sexism in my personal life (and in myself). I interact with other men as a feminist. And it may be the case that, as I learn to better navigate feminist spaces, I begin to once again push my feminist ideals more forcefully, especially now that it's been pointed out to me that at least some other feminists think that I ought to. I've gotten similar criticism myself, which sometimes took me aback. Feminism often feels like a minefield to me... I start backing away from one dangerous spot and find myself in another. Regarding the "armchair"... I keep typing half-formed thoughts on the subject and deleting them because they're not crystalline enough. Which is ironic... holding back ideas about "rationality supremacy" because they don't conform to a particular rationality. I really enjoy reading about this, because very often I can read a male feminist as "well, if it were me" which is silly because yeah, apples and oranges.... but men who want to be allies need to do the "if it were me" as part of their growth. and it's out of the honest "well... if... me... feminist.." they can get honest feedback and grow as well as help other men grow. it's a painfull process for all involved, but a necessary one. Hey Erik, thanks for stopping by. I agree to some degree with the minefield feeling, though I'd like to amend your comment by pointing out that for me, it's not feminism that's the minefield--it's patriarchy. Sure, it's often other feminists who are pointing out blind spots, being critical in various ways--but it's not feminism's fault (so to speak) that those blind spots are there, or that you and I find ourselves in the position where we're trying to avoid the armchair. It's the system we find ourselves in, feminism is the messenger, not the bad news, to brutally mix metaphors. Also, for me, at least, I like to keep in mind that whatever minefied you and I feel we're in, it tends to be relatively benign compared to what a lot of folks go through daily because of sexism and racism and the like. I don't want to downplay the difficulties that feminist and pro-feminist men can have, but I don't want to be too dramatic about 'em either. I think I get what you're saying. And I wholeheartedly agree with you that it's a painful process, but a necessary one. Thing is, as you point out, it's painful for everybody, which makes lots of people (I think) jump ship altogether. I often wonder how many MRA's are people who couldn't understand/take/learn from various criticisms, who couldn't empathize enough to understand the perspectives of others. To be honest, I feel like an armchair everything. I'm job-free and spend most of my time playing video games and participating in Internet discussions. I need to get out more, but I don't know where to go. I consider myself an ally because a lot of things feminism has to say appeal to me (not all), not because I need the label to feel good about myself. I push anti-sexism when I can, and try to observe things from a gender-sensitive lens. However, I have encountered enough alienating and downright misandryst sentiment that I really find myself having issues with trying to apply the label to myself. Maybe I just read the wrong blogs, and maybe my personal standpoint makes me more sensitive, I don't know. I feel like there are a lot of mixed messages directed at men in some way associated with the feminist movement (obviously, the movement is so large and diverse). But I feel like it can't have it both ways, which is what it (from my perspective) is asking for. On the one hand I hear a lot of "we need you" (to men), and on the other, it's "this is a woman's space, this is our fight, back off"
Personally, I'm not willing to participate in a conversation where I have to stay handcuffed to an extend, and where I'm explicitly asked not to dialogue and conduct myself in a way that isn't me. In short, I agree with many (if not most of) feminism's points, but I will peruse goodness and justice on my own terms, and i don't need a label to feel like I'm doing the right thing. That was a mouth full, I hope I don't come off as too spiteful.